I would like to share this rare nebula. It's a not common nebulae and very faint, Sh2 232 is the biggest one at the center top the image. Also on the picture Sh2-235 (the blue one) and Sh2-231. In total 16 hours of integration time with very carefully process. 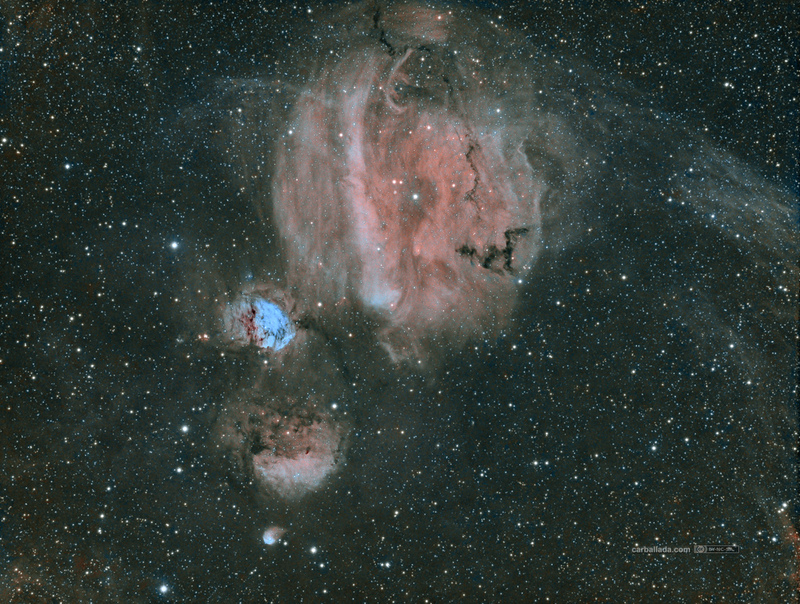 I used a ASI1600 with Astrodon filters on a Teleskop Service TS Photoline 107mm f/6.5 Super-Apo, Riccardi reducer and Astro-Physics Mach1 GTO mount. WOW The Pumpkin is clear if you squint while using averted vision (just kidding. It is easy to see the pumpkin). Edited by Starman47, 20 March 2019 - 07:08 AM. jajaja, you are right! it really obvious! I don't know for what reason it's not called like this? Simply stunning! Fantastic job processing. You are a skilled Astroimager! Nice work, Jose. You did a great job with these faint nebulas. I have some tricolor data on Sh2-235 in the processing pipeline now. It's pretty bright and detailed, but it doesn't seem to get much attention. Very nice. Good choice in color. Thank you Kevin, I hope to see your results soon!! Just I published a new version with more aggressive SCNR to reduce the green gradient a bit. Edited by carballada, 22 March 2019 - 04:58 AM.